I didn’t think skipping a week of the CSA would be that big of a deal. After all, we were out of town until late Monday night, then recovering from the long, six-hour drive on Tuesday. But wow, was our refrigerator bare. I’d taken everything in the crisper to my parents’, I missed the Wednesday Green City Market, and I didn’t want to buy a ton of produce at the grocery store knowing that today’s share was right around the corner. So, the fridge stayed empty, and our vegetable intake was pitifully low. 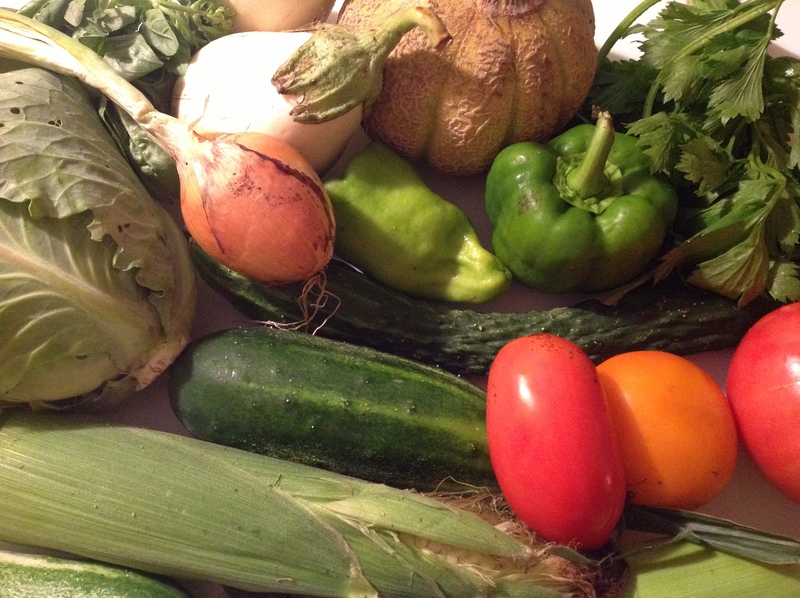 Dana’s accounting of week 12 of our CSA. Color me impressed! I was all too happy to try Darci’s CSA. My previous CSA experience didn’t include the variety that I’d hoped for — so after opting out this year, I’ve been living vicariously through Darci. After pick up, I made a rookie mistake. I left the veggies in my hot car for an hour while I ran an errand and picked up my daughter from camp. When I got home, everything was just a smidge more ripe than it had been when I’d inspected it earlier. I quickly put it all in the fridge, said a prayer to the veggie gods to keep it fresh for at least three days, and set to work finding ways to use it all by then. First up was Saturday night’s dinner. I’d planned on doing “farmer’s market pasta,” which in my house is simply fresh, local tomatoes, onions, garlic and basil over a slightly higher-end brand of pasta (i.e., something even *more* expensive at Whole Foods). Since the share contained plenty of Swiss chard, I changed it up to be a swiss chard and tomato dish. It was delish! I can’t say my kids loved it, but at the very least they tried it and did not utter the words, “Ew, I don’t like it.” My husband and I happily ate their helpings. 1. In a large skillet, sauté the red pepper flakes, onion and garlic in the oil over medium heat. Add the Swiss chard stems and 1/4 cup of the water, cover and cook for about 5 minutes. Add the Swiss chard leaves, the remaining 1/4 cup water, cover and cook for 5 more minutes. 2. Stir in the tomatoes, cover and cook for 3 minutes. 3. Add Italian sausage and simmer on low for 5 minutes. 4. Boil the paste until it’s al dente then drain. 5. 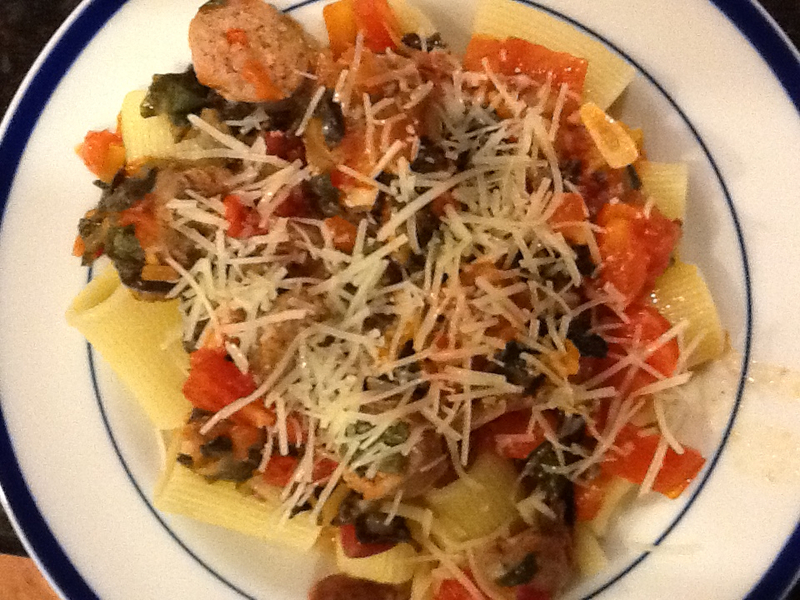 Toss the pasta and the Swiss chard and sausage mixture with the Parmesan cheese. Serve with a healthy sprinkling of Parmesan. Sunday night, I was able to use the grape tomatoes in a lovely simple salad of cucumber, tomato, avocado oil and a touch of red wine vinegar. This was a side dish for our main meal of burgers, along with the AMAZING corn. I don’t think I’ve had corn that good all summer. My kids literally wolfed their ears down. I felt good about my CSA progress, especially considering the tomatoes were the most in need of use, but I was on a roll. For dinner last night, I went full steam ahead and prepared a stir-fry of green beans, broccoli, eggplant, green pepper, the one hot pepper, onion (not from the CSA) and the one leftover ear of grilled corn. I sautéed everything with two tablespoons of olive oil over medium heat while I boiled some Asian flat noodles. I mixed together soy sauce and sesame oil with a touch of ground ginger and poured that over then added a corn starch mixture (2 tablespoons of corn starch dissolved in 1/4 cup of water) at the very end. It thickened perfectly and by not overcooking or over-saucing (it’s a word I’m sure) my vegetables, for the first time in history, everything retained its fresh taste. One note on hot pepper usage: Research what kind of pepper it is before using. WOW, that pepper was hot. The stir-fry was very tasty but it required a whole lot of water in between bites. 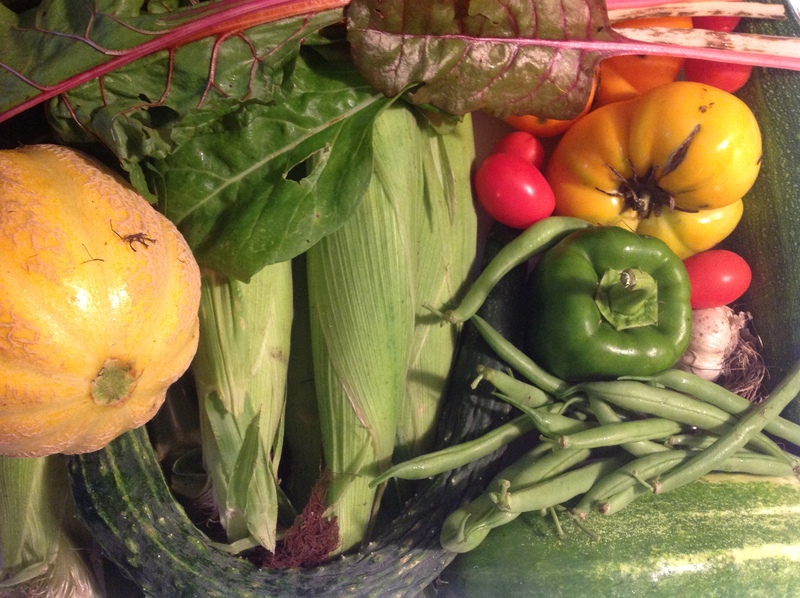 Three days and the CSA is almost 100 percent gone. Just one cucumber is left, and I’ve been using it as a side dish for lunches. What a treat this was for us! Now, where can I get Mike and Darci to go next week? 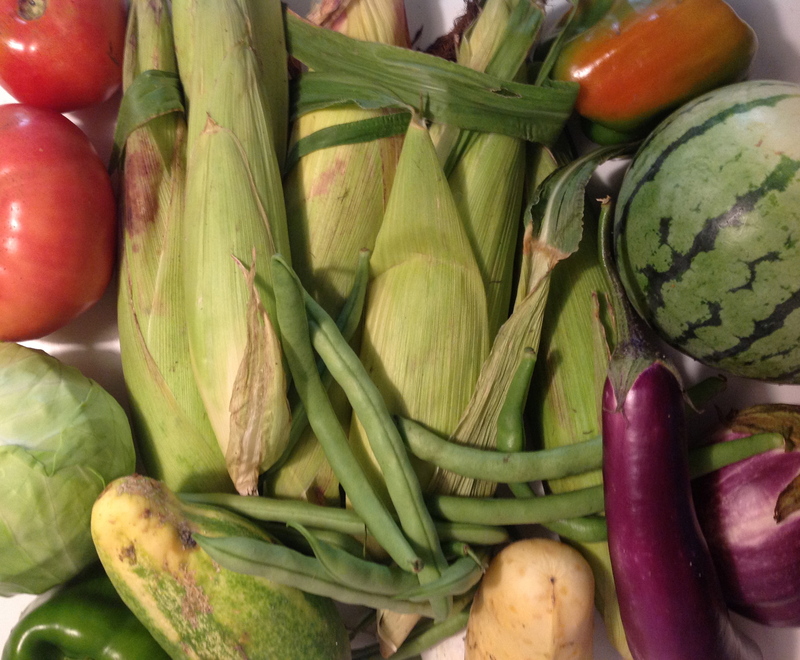 Since Mike and I were in northern Michigan for a long weekend, we couldn’t enjoy or even pick up our CSA share. But my friend Dana happily agreed to do both! One small cabbage — seriously, the tiniest I’ve ever seen — arrived a couple of weeks ago. If this year’s farm is anything like last year’s, I’m fairly certain that it’s the first of many to come. The only issue: I have just three recipes in my repertoire that call for cabbage, and that’s including one for stuffed cabbage rolls. And this li’l guy’s leaves just weren’t big enough for those, which honestly aren’t any fun to make anyway. Plus, stuffed cabbage rolls taste much better on a crisp autumn day than during the summer. Ditto for beef stir fry. So I turned to my go-to recipe for Asian coleslaw, which a friend gave me years ago. I don’t know where she got it from, so I can’t give credit, but it’s been modified along the way. Since, again, this head of cabbage was the size of one Frodo might’ve grown in the Shire, I halved the recipe. We ate it alongside grilled bangers from the farmer’s market. Yum on both counts. 1. 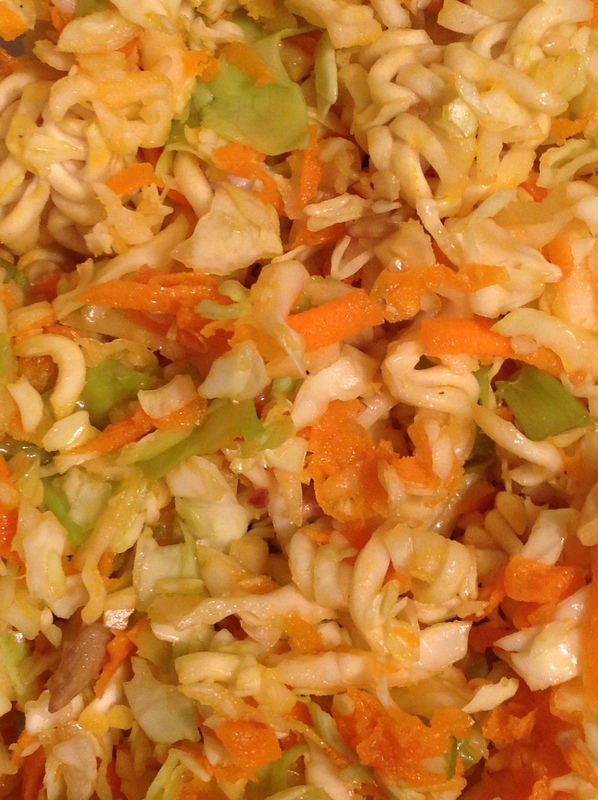 Place cabbage, carrots and green onions in a large bowl and toss. Break up Ramen noodles, add and toss again. 2. Toast the almonds, sunflower seeds and sesame seeds until they’re just beginning to brown and become fragrant. Add them to the bowl, and toss the mixture one more time. 3. In a small bowl, whisk vinegar, sugar, oils, salt and pepper. Pour on top of the vegetables and nuts and mix well. 4. Cover and refrigerate for at least an hour. The last few Fridays I’ve found myself cramming as many of the week prior’s vegetables into that day’s meals as possible. This week was the worst, though — my niece, Leah, is staying with us, and we spent Wednesday morning at the farmer’s market. So in addition to the bounty already in the crisper, we added a few things that piqued her curiosity, like garlic scapes, kohlrabi and an interesting round cucumber with a kiwi-esque peel. Of course, the scapes became Garlic Scapes Carbonara (from this post), which was even better this go-around. I credit this to having a helper during the final stage. Leah stirred like a madwoman while I slowly poured the beaten egg into the ideal spot — only on the noodles and nowhere near the side of the pan. The sauce was creamy and perfect. Tonight’s dinner was a tad more scattered: chicken apple sausages on the grill sided with roasted eggplant and kohlrabi, corn on the cob, and a simple tomato, avocado and kiwi-like cucumber salad. According to Leah, a college senior, the vegetables in this one meal totaled more than her typical intake in a week on her own. Our grill definitely gets a workout in the summer. Unfortunately, I realized in June that I’d developed a (bad) habit of soaking whatever meat was up that night in bottled marinade and calling it a day — not really copacetic with the conscious effort I’ve been making to avoid the prepared and processed. 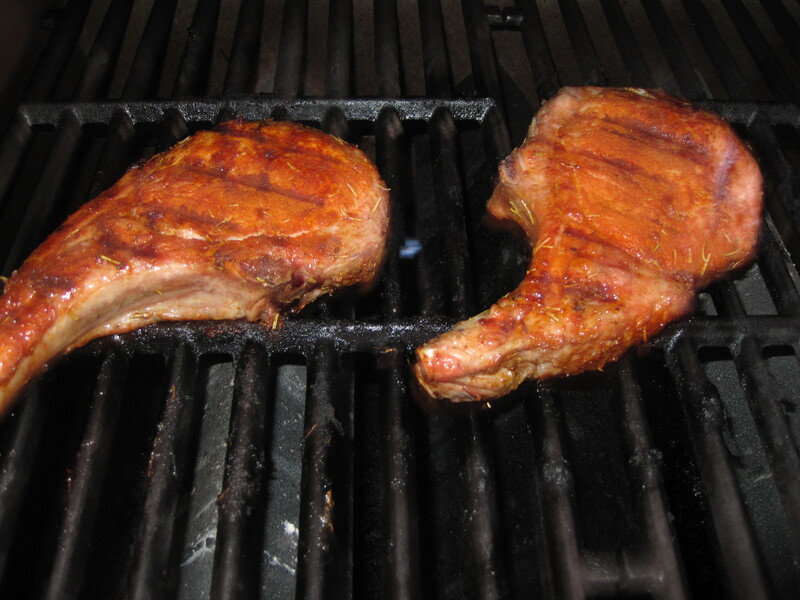 Plus pork tenderloin and chops are our favorite, and marinating was really overkill. 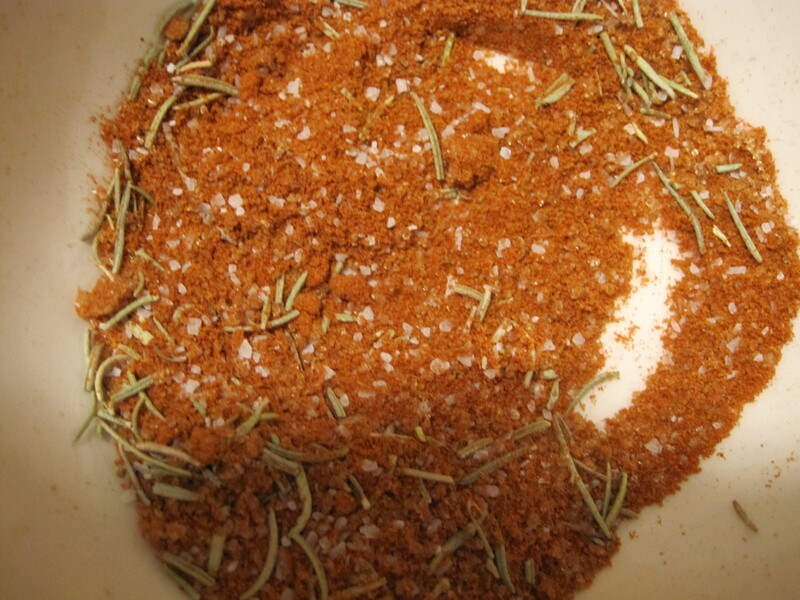 But a quick search revealed that a rub would be perfect, and not difficult to make from scratch. After experimenting with a couple I found online, we’ve become very attached to this rub recipe from the This Little Piggy Went to the Farmers Market blog. The rub doesn’t overpower the natural (and delicious) flavor of the pork, and the spices in it are ones I always have on hand. Week 10 brought more tomatoes (3 pounds!) and our first ears of sweet corn. First off, I totally thought the cutting celery was cilantro until I verified what was in this week’s share through Scotch Hill Farm’s weekly CSA newsletter. Oops.